Never pay retail for any Tour. For our UNADVERTISED Price, fill out this form for real cash savings. Offer is valid for new bookings made April 1 – July 10, 2019 or until release of full fare brochure, whichever is sooner. Applies to departures July 2019 – May 2021. Offers and fares are capacity controlled and may be changed, cancelled or withdrawn at any time. Guests may select ONE offer per person and it must be the same offer for the entire booking. (1) Free roundtrip economy air with a maximum value of $1,500 per person. (2) $1,500/pp Scenic Savings in lieu of economy airfare. Scenic reserves the right to correct errors or omissions and to change any and all fares and promotions at any time. Availability is correct at the time of publishing but cannot be guaranteed. Please ask about upgrading your economy airfare offer to premium economy or business class air. If air offer is selected, flights must be booked through Scenic, on our choice of airlines and are non-refundable once ticketed. A non-refundable initial deposit of $500 per person is required within 48 hours of booking, with full payment required 90 days prior to departure. A secondary deposit of $1500 per person is due upon airfare ticketing. These offers are combinable with past passenger offers, referral offers, travel show & agent training vouchers. Not combinable with Groups, National Geographic departures or any other offers. For the most up-to-date pricing, availability and offers, please call Scenic USA or your Travel Professional. Offers applicable for legal residents of the 50 United States of America & Washington D.C.
Offer are valid for new 2019 bookings made February 15 – May 31, 2019. Offers and fares are capacity controlled and may be changed, cancelled or withdrawn at any time. Free roundtrip economy air available with a maximum value of $1,400 per person for 8-10 day itineraries. Free roundtrip premium economy air available with a maximum value of $2,100 per person 11+ day europe sailings. Scenic Savings up to $1,500 per person available in lieu of flights. Amounts vary by itinerary. Free roundtrip transfers from home to airport up to $450 per booking, April departures only. No cash value. Scenic will coordinate transfers 30 days prior to departure. Offers are based on number of cruise days, and exclude the land portion of the trip. All offers are subject to availability and may sell out. Scenic reserves the right to correct errors or omissions and to change any and all fares and promotions at any time. Availability is correct at the time of publishing but cannot be guaranteed. A non-refundable initial deposit of $500 per person is required at the time of booking, with full payment required 90 days prior to departure. Combinable with past passenger offers, referral offers and show vouchers. Not combinable with groups or any other offer. For the most up-to-date pricing, availability and offers, please call Scenic USA or contact your Travel Professional. Offers applicable for legal residents of the 50 United States of America & Washington D.C. Restrictions may apply. Please contact your travel planner for more details. For new bookings on 2020 Imperial Charms of Russia river cruise. Air offers are only applicable to bookings made 61 or more days before departure, otherwise an air credit will apply. A non-refundable initial deposit of $500 per person is required at the time of booking, with full payment required 90 days prior to departure. A secondary non-refundable deposit of $1500 per person is due prior to air ticketing. Emerald Waterways reserves the right to ticket the airfare upon receipt of deposit. Maximum value of air ticket is $1200 per person inclusive of all taxes & fees. Fly from 25 major US cities, call for list of available gateway cities. Economy Air only on Emerald Waterways’ choice of airlines and routes. Travelers who purchase their own air receive $1000 off per person when booked by June 29, 2019; $750 off per person thereafter. These offers are not combinable with any other offer except Travel Show vouchers, agent training vouchers, EmeraldEXPLORER and referral vouchers. Not combinable with group discounts. Taxes & port charges are included in the price. Offer available to residents of the 50 United States and Washington DC only. Offers and fares are capacity controlled and may be extended, cancelled or withdrawn at any time without notice. *Offer SBC19: Offer valid on bookings made from Apr 18 to Apr 30, 2019. Cruise from $2,499 per person based on select Nov 2019 departures of Rhine Getaway in category F; cruise from $2,199 per person based on select Nov 2019 departures of Romantic Danube in category F; cruise from $1,999 per person based on select Nov 2019 departures of Danube Waltz in category F; other departures may be higher, please call for details. $400 shipboard credit per stateroom valid on all categories. Prices are in US dollars and for US residents only. Viking all-inclusive air with transfers available. Air does not have to be purchased to get cruise/tour offer. All fares reflect cruise taxes, port taxes and fees. Additional restrictions may apply. Book by Apr 30, 2019; pay in full by May 31, 2019 or at time of booking if within 90 days of departure, if earlier. Offer expires Apr 30, 2019. Air Promo: FREE Economy air based on May-select Nov 2019 departures of Rhine Getaway; Danube Waltz; Romantic Danube. Call for details. Air prices are per person based on cruise or cruise tour check-in date and include transfers. Air seats are limited; airfares are subject to change until full payment of air is received. Click here to learn more about airline baggage allowances and fees. Air offers valid on all N. American gateways except Alaska, Hawaii, San Juan and Mexico City. Ask for Offer SBC19. Offer expires Apr 30, 2019. Savings comprised of (2) $200 per person vouchers. These may not be combined with any other vouchers. Restrictions apply; please contact your travel planner for details. Deposit must be made between April 15th and May 31st, 2019. Offer does not apply to all dates and departures. Restrictions apply; please contact your travel planner for more information. *2-Week Sale is valid on select 2019 sailings and expires on April 22, 2019. Featured fares are per person based on double occupancy and promo code(s) NG/FH. Fares are in U.S. dollars. Taxes, Fees & Port Expenses are additional and range from $110.00-$1990.00. All savings amounts are included in the fares shown. Complimentary Veranda Suite upgrades are subject to availability at the time of booking. Upgrade will be reflected in fare paid for selected Suite category. Penthouse and Premium Suite Shipboard Credit offer of up to $1,000 per Suite ($500 per person) is applicable to categories PH, PS, OW, SS, WG and GR and are based on promo ZO. Shipboard credit is only available for the 1st and 2nd guests sharing a Suite. All Shipboard Credits are in U.S. Dollars, are not transferable, non-refundable, have no cash value, expire at the end of the cruise and may not be used in the casino. Shipboard Credit offers may not combine with other Shipboard Credit offers. Combination cruise savings of up to 15% applies when combining consecutive cruises on the same ship and is subject to availability. Reduced deposit of $500 per Suite is valid on select sailings that are outside of penalty periods per standard policy. All offers are capacity controlled and may be modified or withdrawn at any time without prior notice. Other restrictions may apply. Ships’ registry: Bahamas. ©2019 Seabourn. *Visit celebritycruises.com/ for full terms and conditions. Prices are per person, cruise only, for stateroom category 12 or Z, on select sailings and based on double occupancy. Cruise must be booked 04/11/19 – 05/01/19. Offer applies to select 4-night and longer cruises aboard Celebrity Edge, departing 05/15/19 – 08/10/19. 50% Off Savings: Savings applies to the cruise fare of the third and fourth passengers booked in any stateroom category type. Perks Included Offer: Each of the first two guests in an inside through Suite stateroom are eligible to receive all four amenities (beverage package upgraded to Premium Package). Onboard credit is not redeemable for cash and expires on final night of the cruise. Offer not combinable with lowest available cruise fare with a nonrefundable deposit. Offer applies to new individual bookings and to staterooms in non-contracted group bookings, is non-transferable, and not combinable with any other offer. Changes to booking may result in removal of Offer. Offers and prices are subject to availability, cancellation and change without notice at any time. ©2019 Celebrity Cruises. Ships’ registry: Malta and Ecuador. Offer FLSH: Offer valid on bookings made from Apr 16 to Apr 19, 2019. Cruise from $4,999 per person based on select Jul-Aug 2019 departures of Grand European Tour in categories A & B; other departures may be higher, please call for details. Offer not valid on categories F-C. Prices are in US dollars and for US residents only. Viking all-inclusive air with transfers available. Air does not have to be purchased to get cruise/tour offer. All fares reflect cruise taxes, port taxes and fees. Additional restrictions may apply. Jul: Book by Apr 19, 2019; pay in full at time of booking. Aug: Book by Apr 19, 2019; pay in full by May 31, 2019 or within 90 days of departure, if earlier. Offer expires Apr 19, 2019. Air Promo: FREE Economy air based on select Jul-Aug 2019 departures of Grand European Tour. Call for details. Air prices are per person based on cruise or cruise tour check-in date and include transfers. Air seats are limited; airfares are subject to change until full payment of air is received. Click here to learn more about airline baggage allowances and fees. Air offers valid on all N. American gateways except Alaska, Hawaii, San Juan and Mexico City. Ask for Offer FLSH. Offer expires Apr 19, 2019. Save $600 per couple ($300 solo) when you pay in full at time of booking on any of our 2019-2020 Small Group or Private Journeys of 5 nights or more. These savings are reflected in the discounted rates shown, which are per person based on double occupancy. Prices are per person, land only, based on double occupancy, subject to availability and vary by inclusions and travel dates. Save $300 per couple ($150 per person) on Brendan vacations booked with flights on American Airlines, British Airways, Finnair and Iberia on all classes of service. Must book and deposit between 04/05/2019 and 05/16/2019; standard payment policies apply. Valid for travel departing 04/06/2019 through 03/31/2020. Offer is subject to availability and may be withdrawn at any time without notice. Promotion code 19EURO150 will be applied automatically when flights are selected within our online booking portal. Offer FLSH: Offer valid on bookings made from Apr 6 to Apr 8, 2019. Cruise from $3,999 per person based on Jul & Aug 2019 departures of Portugal’s River of Gold; Elegant Elbe in category E; other departures may be higher, please call for details. Prices are in US dollars and for US residents only. Viking all-inclusive air with transfers available. Air does not have to be purchased to get cruise/tour offer. All fares reflect cruise taxes, port taxes and fees. Additional restrictions may apply. Jul 2019: Book by Apr 8, 2019; pay in full at time of booking. Aug 2019: Book by Apr 8, 2019; deposit due within 24 hours; pay in full by May 31, 2019 or within 90 days of departure, if earlier. Offer expires Apr 8, 2019. Air Promo: FREE Economy air based on Jul & Aug 2019 departures of Portugal’s River of Gold; Elegant Elbe. Call for details. Air prices are per person based on cruise or cruise tour check-in date and include transfers. Air seats are limited; airfares are subject to change until full payment of air is received. Click here to learn more about airline baggage allowances and fees. Air offers valid on all N. American gateways except Alaska, Hawaii, San Juan and Mexico City. Ask for Offer FLSH. Offer expires Apr 8, 2019. Terms & Conditions “Air”: New bookings only. Booking Period: April 2-April 30. Applicable for travel April 2-October 31, 2019. Valid on Europe trips that are 9 days or longer. The air discount is valid with Economy, Premium Economy or Business class air (on British Airways, American Airlines, Iberia and Finnair) to Europe journeys and excludes Greece. The air savings levels are: $250 per person on Economy (Use promo code: AP19EUROAIR250), $300 per person on Premium Economy (Use promo code: AP19EUROAIR300) and $350 per person on Business Class (Use promo code: AP19EUROAIR350). If the airfare (not including taxes and surcharges) is less than the amount of the discount being advertised, the maximum discount will be up to the airfare amount. Only applicable to live air available for purchase at time of booking. Air portion non-commissionable to travel advisors. Based on availability, does not apply to all trips/departures, and may be withdrawn at any time and without notice. Combinable with “Land & See” promo below, and with year-round discounts except Early Payment and Last Minute discounts. Not combinable with other promotions. PAYMENT: A deposit of up to $200-$550 per person is due within 3 days of booking with full payment 45 days before departure. CST No. 20687545-20. Terms & Conditions “Land Savings”: New bookings only. Booking Period: April 2-April 30. Applicable for travel April 2-October 31, 2019. The land savings is $150 per person on Europe trips that are 9 days or longer and excludes Greece (Use promo code: PP19LANDSEE150). Based on availability, does not apply to all trips/departures, and may be withdrawn at any time and without notice. Excludes group bookings. Combinable with “Air” promo above, and with year-round discounts except Early Payment and Last Minute discounts. Not combinable with other promotions. PAYMENT: A deposit of up to $200-$550 per person is due within 3 days of booking with full payment 45 days before departure. CST No. 20687545-20. Free Economy Air with optional Upgrade to Business Class is available for new bookings only on select 2019 itineraries and departures made between April 1, 2019 and April 30, 2019. Must call to book free air. Cruise fares shown are per person based on double occupancy with economy class air including all airline fuel surcharges, government fees and taxes for select US gateways. Gateways not included in this offer will be charged an air add-on fee of up to $500 per person. Air schedules will be determined and air tickets will be issued at the sole discretion of Uniworld. Requests to customize air schedules beyond choosing a non-included gateway, will result in additional fees and any increase in airfare will be charged to the guest. A non-refundable deposit of $450 per person is due at time of booking in addition to the standard 10% deposit. Air bookings may be cancelled within 24 hours of booking to receive a complete refund. This offer is not combinable with any other promotion, is capacity controlled and may be modified or withdrawn at any time without notice. Economy and Business Class air is subject to availability at time of booking. Free Economy Air offer is not applicable to suites. Other restrictions may apply. INCLUDED US GATEWAYS: ATL, AUS, BDL, BNA, BOS, BWI, CLT, CMH, CVG, DEN, DFW, DTW, EWR, FLL, IAD, IAH, JFK, LAS, LAX, MCO, MCI, MEM, MIA, MSY, ORD, PDX, PHL, PHX, PIT, RDU, SAN, SEA, SFO, SLC, SMF, STL, TPA, TUL. † Bookings made less than 120 days prior to departure require payment in full at time of booking. *Visit celebritycruises.com/for full terms and conditions. Prices are per person, cruise only, for stateroom category 8 or Y, on select sailings and based on double occupancy. Cruise must be booked 04/04/19 – 05/01/19. Offer applies to select 4-night and longer cruises departing 05/04/19 – 04/30/21. Galapagos itineraries are excluded. Non-Refundable Deposit Offer: To qualify for the lowest available cruise fare, guest must choose a non-refundable deposit on sailings departing 05/04/19 – 04/30/21. Non-refundable deposit booking (“NRDB”) cancelled prior to final payment due date will receive a future cruise credit in the amount of the deposit minus a $100 per person service fee. FCC is non-transferable and expires after 12-months from issue date. $100 per person service fee applies to changes to NRDB ship or sail date. Applicable to groups at prevailing rates. Not applicable to incentive, contract, or charter groups. Nonrefundable deposit offers are not applicable to sailings within final payment. 50% Off Savings: Savings applies to the cruise fare of the third and fourth passengers booked in any stateroom category type. Not applicable to Cruisetours. Perks Included Offers: Each of the first two guests in an inside through AquaClass stateroom are eligible to receive two amenities with the choice of a “Two Perks Included” rate or four amenities with the choice of an “Four Perks Included” rate. Each of the first two guests in a suite receive four amenities (beverage package upgraded to Premium Package). Onboard credit is not redeemable for cash and expires on final night of the cruise. Offer applies to new individual bookings and to staterooms in non-contracted group bookings, is non-transferable, and not combinable with any other offer. Changes to booking may result in removal of Offer. Offers and prices are subject to availability, cancellation and change without notice at any time. ©2019 Celebrity Cruises. Ships’ registry: Malta and Ecuador. 10% off new bookings on select 2019 tour departures booked between April 4-22, 2019: Best of Ireland South – May 11, June 13, 22, 29; Best of Britain – August 25; Irish Classic – June 27, 29, July 11, 25, August 8, 29, 31; Taste of Italy – May 12, June 9, July 14, September 1; Scottish Dream – May 19, 24, 29, June 9; Highlights of Britain – June 23, August 25; Irish Legends – August 6, 13, 23, 27; Irish Spirit – May 9, August 17; Taste of Scotland & Ireland – May 7, 10, 17, June 25; Irish Heritage & Dromoland Castle – May 20, August 5. Use promo code: APR1910. Does not apply to groups, Private Driver or self-drive. $500 per person non-refundable deposit required. Subject to availability, not combinable with any other CIE Tours offers/discounts and may be withdrawn at any time. Advertised price is per person, land only based on double occupancy and reﬂects the discount. Other conditions may apply. All Fares are in US/CAD Dollars, per guest, based on double-occupancy in a Vista suite. Fares are capacity controlled and subject to change at any time without notice. Promotional Business Class Air rate of USD 699 / CAD 999 is each-way based on trans-Atlantic travel from select U.S. and Canadian gateways; Economy Class Air is provided on domestic US/Canada flights and intra-European flights. Promotional air offer is valid only for guests from the United States and Canada. Silversea reserves the right to select the air carrier, routing and departure airport from each gateway city. The Promotional Business Class Air rate is only available to the first and second full-fare guests in a suite. Airline baggage fees are not included. Deviations to air travel dates are accepted at a charge of $150 per request plus all additional air costs. Due to flight schedules, some voyages may require an overnight hotel stay pre or post-cruise. This will be available for booking at an additional charge. In the event neither Business Class nor Economy Class air is available (determined at Silversea’s sole discretion) or for guests not utilizing the promotional air offer or for non-US/Canadian guests, a non-use Air credit in the amount of USD 900 / CAD 1,150 may be applied. In case of succeeding voyages made by the same customer (combo or multiple bookings) the non-use credit can be only applied once. Offer applies to new bookings made between 1 April, 2019 and 31 May, 2019. In case of succeeding voyages made by the same customer (combo or multiple bookings) the non-use credit can be only applied once. Additional restrictions may apply. Ships’ registry: Bahamas. *Standard terms apply. View complete terms and conditions. Air Upgrade, if applicable, is a Premium Economy Air Upgrade only available when air is purchased through Oceania Cruises. It applies to intercontinental flights only and is priced per person, each way, on select voyages from select gateways, open to all categories for Europe embark and disembark ports only and based on availability. Not all amenities will be available on all carriers. *Itineraries with an asterisk (*) also travel in reverse. Picture-Perfect Savings are valid for new, individual bookings on select 2019 itineraries and departure dates only, made between April 1, 2019 and May 31, 2019. Offer applies to full-fare bookings only. All fares and savings listed are in US Dollars. Fares featured are for cruise or cruise/tour only, per person (unless otherwise noted) based on double occupancy. Rates for single guests are available upon request. Rates and savings vary by itinerary and departure date. Offer is not combinable with any other promotional offer or program, except River Heritage Club savings/benefits. All applicable discounts are applied sequentially; fixed savings amounts are deducted prior to applying any percentage-based discounts. Offer is capacity controlled and may be modified or withdrawn at any time. Other restrictions may apply. All itineraries, schedules, and ports are correct at time of publication but are subject to change without notice. “Windstar Cruises,” “Windstar,” “We,” and “Us” refer to Windstar Cruises Marshall Islands, LLC, a Limited Liability Company that owns and operates the cruise line known as Windstar Cruises. “You,” “passenger” and “guest” refer to persons travelling with Windstar and those in their care, such as minor children. Due to the small size and intimate nature of our yachts, Windstar Cruises is unable to accommodate children under eight (8) years of age. Guests under 21 years of age must be accompanied by a parent, guardian or chaperone in their stateroom or suite who is at least 25 years old; one adult (age 25 or older) chaperone is required for every five (5) people under 21. Should you need to contact Windstar Cruises prior to cruising, use this address: Windstar Cruises, 2101 4th Avenue, Suite 210, Seattle, WA 98121, U.S.A. PASSAGE CONTRACT: All cruises are provided subject to the terms of the Windstar Cruises Passage Contract, which can be found here, and which contains important, comprehensive additional terms governing your cruise with us including among other things limits on claims and liability, resolution of claims, etc. CRUISE FARES: Your fare includes ocean transportation, stateroom or suite accommodations, and all meals and entertainment on board the yacht. Not included, however, are items of a personal nature, such as alcoholic beverages, laundry, transfers prior to or after your cruise, or optional programs or activities. Shore excursions and airfare are available for an additional charge. All rates shown are per person based on double occupancy. Fares are published in U.S. dollars (USD). Note: Third-person rates are available upon request. For further information on fares, nondiscountable amounts, taxes, and surcharges, please see below. SINGLES: Single occupancy of a stateroom is generally 175% of the published per person stateroom cruise fare (200% of the Owner’s Suite, Suites, and Bridge Suites per person cruise fares) and is subject to availability. Offer applies to select 2019 Rhine, Main, Danube and Rhone river cruises, for new bookings made April 1-30, 2019. The Spring into Savings offer shows maximum savings; all cruises are on sale and savings may vary from cruise to cruise. A non-refundable initial deposit of $500 per person is required at the time of booking, with full payment required 90 days prior to departure. For departures within 90 days, full payment is due at the time of booking.These offers are not combinable with any other offer or except for Travel Show and agent training vouchers. Not combinable with group discounts. Taxes & port charges are included in the price. Offer available to residents of the 50 United States only. Offers and fares are capacity controlled and may be extended, canceled or withdrawn at any time without notice. Elevate & Explore offer is capacity-controlled and applies to new bookings only made beginning on 4/1/19 in the U.S. and Canada. Offer is combinable with standard published promotional offers, however, is not combinable with Canadian Dollars at Par or Single Supplement Specials. On the November 16, 2019, December 6, 2019, December 20, 2019 and January 21, 2020 voyages aboard Seven Seas Voyager®, guests will receive a 3-category suite upgrade; book a Category H Suite and receive a Category E Suite, or book a Category G Suite and receive a Category D Suite, or book a Category F Suite and receive a Category C Suite, or book a Category E Suite and receive a Category B Suite, or book a Category D Suite and get a Category A Suite. On the February 12, 2020, March 13, 2020, and March 27, 2020 voyages aboard Seven Seas Voyager®, guests will receive a 2-category suite upgrade; book a Category H Suite and receive a Category F Suite; book a Category G Suite and receive a Category E Suite; book a Category F Suite and receive a Category D Suite; book a Category E Suite and receive a Category C Suite; book a Category D Suite and receive a Category B Suite; book a Category C Suite and receive a Category A Suite. On the December 5, 2019, December 23, 2019, January 3, 2020, January 23, 2020, February 8, 2020, March 13, 2020, and March 28, 2020 voyages aboard Seven Seas Navigator®, guests will receive a 2-category suite upgrade; book a Category H Suite and receive a Category F Suite; book a Category G Suite and receive a Category E Suite; book a Category F Suite and receive a Category D Suite; book a Category E Suite and receive a Category C Suite; book a Category D Suite and receive a Category B Suite; book a Category C Suite and receive a Category A Suite. Guests on all applicable voyages above will also receive a Shipboard Credit of $125 per guest, up to $250 per suite. Shipboard Credit is non-transferable and may not be redeemed for cash. Offer may be withdrawn at any time. Mention “ELEVATE & EXPLORE” at time of booking. Offer applies to new, individual bookings made 03/12/19 – 06/05/19 for select 7, 10 and 11-night Galapagos cruise and cruise packages aboard Celebrity Flora departing 05/26/19 – 12/31/19. Offer includes half off a second guest cruise fare with the purchase of first guest cruise fare at full price, plus round trip air fare, valued up to $1,500 per person including air taxes and fees, departing from US or Canadian gateways, booked via Flights by Celebrity. Guests with independent air arrangements may choose a $1,000 per person cruise fare savings instead of airfare via Flights by Celebrity. Offer applies to the first two guests in the stateroom, is subject to availability, subject to change, capacity controlled, non-transferable, not combinable with any other offer, and may be withdrawn at any time without notice. Cancellation of Air Tickets: Air tickets may be purchased on a non-refundable or refundable basis and are each subject to the cancellation terms of the applicable airlines and Flights by Celebrity. Offer available to residents of the United States and Canada. Refer to Cruise Ticket Contract for additional terms and conditions. Celebrity reserves the right to correct any errors, inaccuracies, or omissions, and change or update fares, fees, and surcharges at any time without prior notice. ©2019 Celebrity Cruises Inc. Ships’ registry: Ecuador. Book Now Savings valid for new bookings made between March 1, 2019 and April 30, 2019. Book Now Savings vary by departure, are capacity controlled subject to availability on select sailings only, are based on double occupancy for the first two full-fare guests in stateroom or suite, and are included in published cruise fare as shown. Offer may be withdrawn or changed at any time without notice at the discretion of Crystal Cruises. A cruise deposit, an amount which may vary by departure, is required at the time of booking regardless of voyage length. Prices listed are for S5 or W2 and are subject to change without notice. Unavailable rooms may be waitlisted. Waitlist will be cleared at Crystal’s discretion. Crystal Cruises reserves the right to correct errors or omissions and to change any and all fares, fees, promotions and programs at any time with or without notice. Ultimate Alaska offer applies to new bookings only made starting 12/17/18 on select 2019 voyages aboard Seven Seas Mariner®. Bookings can be made up to 60 days prior to departure for applicable voyages. Offer may be withdrawn at any time without prior notice. On voyages departing June 5, June 19, June 26, July 3, July 13, July 24, July 31, August 14, August 21, August 28, September 4, September 11 and September 18, guests can combine one their voyage with a 5- or 6-night Pre- or Post-Cruise Rocky Mountaineer Land Program and save up to $6,130 off the combined package fare. Actual savings varies based on voyage and suite category booked and is based on double-occupancy fares; savings is not available on single-occupancy fares. Savings does not apply to airfare, pre-cruise hotel or any incremental add-ons. Offer is available only to the first and second guest per suite. Offer is not combinable with Canadian Dollars at Par, Single Supplement Specials, Special Kids Fares or any upgrade offers. Please call Regent Seven Seas Cruises® or your Travel Agent for fares by voyage and suite category. Mention “ULTIMATE ALASKA” at time of booking. Savings based on per person, in USD ($) and applies to the cruise portion of the package only on published brochure fares. Prices shown on itinerary pages are inclusive of Early Booking Savings. This offer is valid for new, individual bookings only, for departures between April 1, 2020 – March 31, 2021, is capacity controlled, and subject to withdrawal at any time without notice. Savings up to 30% on cruises to North America, Mexico & Central America, and South America. Savings up to 25% on cruises to Alaska, Antarctica, Franz Josef Land, Greenland, Iceland, the Northwest Passage, and Svalbard. This offer cannot be combined with any other promotion except the Ambassador and Child offers. All expeditions are subject to availability at the time of booking. Offer is valid December 3, 2018 – April 30, 2019. Offer is not applicable to categories OX, BX, or MX (Sail Away Categories). Offer is not applicable to Studio or Inside categories. Offer not applicable to 1-3 night sailings. Offer is for new individual FIT reservations only. Qualifying new individual FIT reservations can be moved into an existing FS speculative group and count towards tour conductor credits. Offer is not valid for affinity or tour operator groups and cannot be held as group block. Promotion cannot be held as group block. Singles paying 200% of voyage fare qualify. Anything consumed above the promotional benefit will be the responsibility of the guest at prevailing rates. Government taxes, port expenses & fees, discretionary onboard service charges and/or gratuities are additional. Cancellation Fees also apply based on the booking/sailing date; therefore, Norwegian Cruise Line strongly recommends the purchase of travel protection on all bookings. No components included in this offer have any monetary value, are non-refundable and non-transferable. Offer and combinability with other promotional offers is subject to change at any time per Norwegian Cruise Line’s discretion. Other restrictions may apply. Norwegian Cruise Line reserves the right to cancel or withdraw this offer at any time. Applicable to NCL MIAMI. Not applicable to NCL INTL, AUSTRALIA, NCL BRAZIL, NCL ASIA or CE and UK offices. Reservation must be made more than 16 days prior to sailing to qualify. Air offer applies to economy, round-trip flights from select departure gateways only and will automatically apply. Air gateway(s) must be entered in order to prompt free or reduced airfare. Offer only valid on select 4+ day cruises. Blackout sail dates are at the discretion of Norwegian Cruise Line. 3rd-8th guests will receive $50 off Norwegian Cruise Line’s regular air/sea rates each way. Guests may request to deviate air when selecting the free or reduced air option. Deviations of up to 2 days pre/post cruise will be charged $25 USD per person. No other deviation requests will be permitted. Offer includes air taxes, fees & surcharges. Guests are responsible for airport transfers at an additional cost if selected. Airline imposed personal charges such as baggage fees may apply. All guests booked within a singular reservation will be booked on the same flight. Norwegian Cruise Line will book guests’ airfare with a maximum of one connection when possible; air schedules permitting. routing and city airport from each gateway city and reserves the right to substitute commuter service and/or charter air service for scheduled air carriers without prior notice. Haven, Suite & Concierge categories are not applicable for this offer. Offer is only applicable for mini-suites and below. Offer is for new individual FIT reservations and new group delegates booked outside of finalization. Qualifying new individual reservations can be moved into existing group and count towards tour conductor credits. Reservation must be assigned with names. Guests who cancel and rebook must accept this promotion’s terms and conditions. For reduced deposit reservations cancelled during deposit fee period, fee amount will be assessed in line with terms of booked promotion Singles paying 200% qualify. Government taxes, port expenses & fees, general excise tax (GET), and discretionary on board service charges and/or gratuities are additional. Applicable to NCL MIAMI, NCL INTL, NCL ASIA, and AUSTRALIA. Not applicable to NCL BRAZIL, CE and UK offices. 2019-2021 OCEAN CRUISE AND AIR SAVINGS: Offer applies to bookings made from Apr 1-30, 2019. Special cruise fares plus $199 air valid on Cultural Cuba (select 2020); New York, Bermuda & the West Indies (2019). Air savings vary on other itineraries. Air offers valid on all North American gateways except Alaska, Hawaii, San Juan and Mexico City. Air does not have to be purchased to get cruise/tour offer. All prices are in US dollars and for US residents only. Additional restrictions may apply. 2019: Book by Apr 30, 2019; pay in full by May 31, 2019. 2020: Book by Apr 30, 2019; pay in full by June 30, 2019. 2021: Book by Apr 30, 2019; pay in full by Dec 31, 2019. Offer expires Apr 30, 2019. Our Pricing and Savings Policy: All rates are per person, based on double occupancy, cruise only, in USD, and subject to availability. Rates may vary by ship, departure date, and stateroom category. All rates, savings, offers and itineraries are subject to change without notice. Savings and offers may be withdrawn at any time. Azamara reserves the right to correct any errors, inaccuracies or omissions and to change or update fares, fees and surcharges at any time without prior notice. Share & Save Offer (“Offer”) provides 50% off cruise fare of the second guest (“BOHOGO”) and $500 Onboard Credit (“OBC”). Offer applies to new individual bookings created between April 1, 2019 – May 31, 2019 (“Offer Period”). Offer applies to select sailings departing on or after August 3, 2019. Buy One Get One Half Off (“BOGOHO”) provides 50% off cruise fare of the second guest booked in the same stateroom as the first full fare paying guest. All other charges, including, but not limited to, cruise taxes, fees, and port expenses, are additional and apply to all guests. Offer applies to all stateroom categories; category availability varies by sailing. Offer may not be available on all categories on all sailings. BOGOHO+: Offer provides one Unlimited Internet package for guest booked in an oceanview or higher stateroom under BOGOHO offer. Unlimited Internet package provides guest with unlimited internet minutes for use onboard; one device per package. Internet connectivity and speed is subject to location of ship, availability of satellite signal, and is not guaranteed 100% of the time. Onboard Credit (“OBC”) amount is per stateroom, in USD, has no cash value, is not redeemable for cash, is not transferable, and will expire if not used by 10:00 PM on the last evening of the voyage. $500 OBC amount is based on double occupancy and applies to all stateroom categories. OBC for single bookings will be prorated based on single supplement paid ($500 for 200% supplement, $375 for 150% supplement, $312.50 for 125%, etc.). OBC cannot be used in the Casino or for future cruise bookings. Limit one offer per stateroom. Offer applies to new, individual bookings and non-contracted group bookings named and fully deposited during the Offer Period. Offer is not applicable to incentive or contracted groups. Offer is combinable with BOGOHO+, Back to Back Benefits, onboard booking savings and Le Club Voyage Quarterly Savings. Unless stated otherwise, offer is not combinable with any other offer or promotion, including, but not limited to, any other OBC offers, Last Minute Voyages, Closed User Rates, Employee Rates, Interline Rates, Travel Agent Rates, and Net Rates. Offer is not applicable to 3rd and 4th guests in a stateroom. After the Offer Period, the offer will be removed from the booking if the guest cancels and reinstates the booking, applies a fare change, or changes the ship or sail date of the booking; certain other changes to the booking may also result in removal of the offer. Offer is subject to availability and change without notice and may be withdrawn at any time. This offer is applicable to U.S., Canada, and select global markets only. Refer to AzamaraClubCruises.com/SHAREANDSAVE and the Cruise Ticket Contract for additional terms and conditions. ©2019 Azamara Club Cruises. Ships registered in Malta. Intended for U.S. transmission only. Offer is valid for new bookings made from April 1, 2019 until sailing. Offers and fares are capacity controlled and may be changed, cancelled or withdrawn at any time. Scenic Savings are $1,500/pp for 8-10 day sailings, $2,000/pp for 11 – 14 day sailings and $3,000/pp for 15 day sailings. Offers are based on number of cruise days, and exclude the land portion of the trip. Scenic reserves the right to correct errors or omissions and to change any and all fares and promotions at any time. Availability is correct at the time of publishing but cannot be guaranteed. A non-refundable initial deposit of $500 per person is required at the time of booking, with full payment required 90 days prior to departure. These offers are combinable with past passenger offers, referral offers, travel show & agent training vouchers. Not combinable with Groups, National Geographic departures or any other offers. For the most up-to-date pricing, availability and offers, please call Scenic USA or your Travel Professional. Subject to availability, for new bookings only. Deposit required at time of booking. For past Tauck guests only, we’re offering a Gift of Time of one FREE hotel night at Tauck’s selected hotel before or after any 2020 Tauck trip when your trip and hotel are booked in advance by September 27th, 2019 (certain restrictions apply; please call your travel planner for details). Save $1,000 per stateroom ($500 per person) on any cabin on the following American Duchess 2019 voyages: 5/19, 5/26, 6/2, 6/9, 6/16, 6/23, 9/8, 9/15, 9/22, 9/29, 10/6, 10/13, 10/20, 10/27, 11/3, 11/10, 11/17, 12/1, 12/8, 12/15, 12/22. Save $300 per stateroom ($150 per person) on any cabin on the following American Empress 2019 voyages: 4/28, 5/12, 5/26, 6/9, 6/23, 8/4, 8/18, 9/1, 9/29, 10/13, 10/27, 11/10, 11/17. Save $1,000 per stateroom ($500 per person) on cabin category C or above or save $300 per stateroom ($150 per person) on cabin categories D or E on the following American Queen 2019 voyages: 5/19, 5/26, 6/2, 6/9, 6/16, 7/21, 8/25, 9/1, 9/8, 9/15, 9/22, 9/29, 10/6, 10/13, 10/20, 10/27, 11/3, 11/10, 11/17, 11/24, 12/1, 12/8, 12/15, 12/22. Offer not valid on American Empress cabin categories CS and LS. Offer expires May 31, 2019, or when no valid cabins remain. Valid on new, paid-in-full bookings. Singles booked in double-occupancy cabins will receive double the discount. Not valid on group bookings or existing reservations. Cannot be combined with other promotions or discounts. Promotional fares and amenities are capacity-controlled, may vary by sailing and may be withdrawn without notice. Cruise fares quoted are in U.S. dollars, are per person and do not include government taxes and fees, port charges, gratuities, insurance, personal expenditures or transportation costs incurred while traveling to and from embarkation ports. Not responsible for errors or omissions. Additional terms and conditions may apply. Call for details, and mention Offer Code 2019 SAVINGS. Single Supplements are capacity controlled and may be increased at any time. Single Supplement savings are available on select voyages and categories. Offer is valid for new bookings only made between January 5, 2019 and March 31, 2019. Single Supplement savings are not combinable with Upgrade Offers, Resident Specials, Special Savings for Kids, or other promotions. All fares shown are based on suite Category G on Seven Seas Voyager®, Seven Seas Mariner® and Seven Seas Navigator® and on Category G2 on Seven Seas Explorer® (excluding Seven Seas Voyager® July 2, 2019 voyage which is based on Suite Category F, Deluxe Veranda Suite) and represent air-inclusive fares based on current promotion including any dollars off promotions. *Itineraries also travel in reverse. Receive 10% of your cruise rate back as onboard credit. Based on 10% of the cruise rate of the first and second passengers only. NOT including taxes, fees, port expenses, or airfare, after all discounts applied. Rounded down to the nearest $25 increment. Terms & Conditions: All rates are per person in USD based on double occupancy in a base category stateroom unless stated otherwise. FREE AIRFARE is valid on select sailings for new double occupancy reservations booked and deposited by May 31, 2019. FREE AIRFARE promotion is based on round-trip, trans-Atlantic economy-class airfare departing from select gateways as published (based on availability). FREE AIRFARE promotion includes base ticket price, fuel surcharges, taxes and roundtrip airport transfers between the airport and ship and/or hotel for services purchased through AmaWaterways for a published itinerary only. FREE AIRFARE promotion is not applicable to triple/child fares. The deposit requirement for this Free Air promotion is $750 per person, $550 of which is non-refundable. Guest(s) must pay full brochure (published) fare for all itinerary components in order qualify. Flight schedules, routings and air carriers are at the discretion of AmaWaterways and are published approximately 75 days prior to departure or sooner. Custom itineraries, itinerary requests and schedule deviations are not accepted on this promotion. Air carrier and flight schedule will be confirmed by AmaWaterways and cannot be substituted. No recourse available for those who wish to change or cancel their selected flight schedules. Additional luggage fees and other ancillary charges imposed by the carrier will apply and can be found on the carrier’s website on or after the release of the flight schedule. FREE AIRFARE not combinable with Solo Traveler Program bookings or any other promotions/discounts. Must mention promo code FLYFREE-EB in order to receive. Stateroom upgrades, land programs, port charges, visas, and gratuities are additional. Other restrictions apply. Offer is capacity-controlled and subject to modification, reduction or withdrawal without notice. PRICE GUARANTEE Once you have paid in full for your trip, you are safe from any additional charges. Airfare increases, currency fluctuations, increased fuel surcharges, new government taxes—none of these will apply to you. 2019-2020 RIVER CRUISE AND AIR SAVINGS: Offer valid on bookings made from April 01, 2019-April 30, 2019. Special cruise fares plus FREE air valid on available 2019 departures of Grand European Tour, European Sojourn, Paris to the Swiss Alps (Mar & Apr), France’s Finest, Waterways of the Tsars (2019 & 2020) and Kiev to the Black Sea. Air savings varies on other itineraries. Air offers valid on all North American gateways except Alaska, Hawaii, San Juan and Mexico City. Air does not have to be purchased to get cruise\tour offer. All prices are in US dollars and for US residents only. Additional restrictions may apply. 2019: Book by April 30, 2019; pay in full by May 31, 2019. 2020: Book by April 30, 2019; pay in full by June 30, 2019. Offer expires April 30, 2019. AIR UPGRADE: Upgrade to Premium Economy air from $795 per person or Business Class air from $2,995 per person based on select gateways and dates. Flat rate of $1,995 for Grand European Tour, France’s Finest and European Sojourn on Suites and above. Additional airline-imposed baggage charges may apply; for more information visit Airline Luggage Restrictions . Air prices are per person based on cruise/cruisetour check-in date and include transfers plus all government taxes/fees of approximately $160 and air fuel surcharges. Air seats are limited; airfares are subject to change and are not guaranteed until full payment of air is received. For more information about customized air services and US gateways, visit the Viking Air Plus page. GENERAL RESTRICTIONS: Cruise fares listed are cruise only in US dollars, per person, based on double occupancy and for US residents only. Cruise ship fuel surcharge may apply. All fares and offers are for new bookings made April 01, 2019-April 30, 2019, are subject to availability; may not combinable with other offers except Viking Explorer Society Credit and Viking Referral Rewards. Special cruise fares are based upon published full cruise fares; cruise fares do not include prepaid charges, optional facilities and service fees, and personal charges, as defined in the terms and conditions of the Passenger Ticket Contract which may be viewed elsewhere on this website. Full cruise fares may not have resulted in actual sales in all stateroom categories and may not have been in effect during the last 90 days. Promotional fares may remain in effect after the expiration date. Air promotion applies to economy, roundtrip flights only from select Viking River Cruises US gateways and includes airport-to-ship or hotel transfers, air taxes and air fuel surcharges. Viking reserves the right to correct errors or omissions and to change any and all fares, fees and surcharges at any time. For up-to-date prices, please call Viking or your Travel Agent. The cruise ship fuel surcharge is additional revenue to Viking Cruises, as are any additional charges relating to currency fluctuation other than for fully paid cruise fares and full fares, which fluctuations are beyond our control. All fares include cruise taxes, port taxes and fees. Additional terms and conditions may apply. Complete terms and conditions may be found in the Passenger Ticket Contract. AIR OFFER RESTRICTIONS: Offer expires April 30, 2019. Note: U.S. flights depart one day prior to check-in date. Paid Business or Premium Economy Class may require travel in economy on flights within North America or Europe. Premium economy is limited to specific airlines and we may not be able to accommodate based on aircraft type and availability. Roundtrip airport transfers are included when air is purchased with a cruise or cruisetour package; if air is not purchased from Viking, transfers may be purchased separately. All transfers must be in conjunction with a Viking-purchased cruise, cruisetour, land extension or extra hotel nights. Air prices are per person based on cruise/cruisetour check-in date and include transfers plus all government taxes/fees of approximately $160 and air fuel surcharges. Air seats are limited; airfares are subject to change and are not guaranteed until full payment of air is received. Book a 2018, 2019 or 2020 Globus, Monograms, or Avalon Waterways vacation (excluding Globus Escapes, Cuba vacations, and 2020 Oberammergau) to save an additional 5% per person on the land-only portion of the core tour not including extra night accommodations, hotel upgrades, extensions, taxes, fees, tips or supplements. Booking must be made by December 31, 2019 for travel no later than December 31, 2020. Benefit is available only to members of The Travel Collection, a travel program sponsored by The Travel Leaders Group, LLC. Valid for new bookings made through a Travel Collection specialist with participating vacation partners. Benefit is not available to residents outside the United States and its territories and possessions. Offer valid with any other approved Globus family of brands published offer (excluding Globus Escapes, Cuba vacations and 2020 Oberammergau). This offer is also combinable with Travel Leaders Amenity Departure Dates sailings. Offer is NOT combinable with the American Express Cruise Privileges Program. Not applicable to custom tours. Discount will apply to individual members of groups adding a name and non-refundable per person deposit WITHIN the promo window or to new group bookings, but only to those individuals providing name and non-refundable deposit. Applies to new 2018, 2019, and 2020 bookings only, and offer will not be applied to pre-existing bookings. Offer reliant on space availability. Full cancellation penalties will apply. Additional restrictions may apply. Participating partners and benefits are subject to change. May be withdrawn at any time. double occupancy fare, valid on lower categories and on select voyages. The promotion is capacity controlled and can be closed at any time. Cancel and re-books do not qualify. Other restrictions may apply.Single guests benefit from a 10% or 25% single supplement above the double occupancy fare, valid on lower categories and on select voyages. The promotion is capacity controlled and can be closed at any time. Cancel and re-books do not qualify. Other restrictions may apply. Ships’ registry: Bahamas and Ecuador. All offers subject to availability and may be withdrawn at any time. Cruise offers valid on stateroom categories 1-3 only. Egypt Itineraries: Cannot be combined with Marco Polo Club single supplement discount or any other single supplement discounts. “*Fares and Early Booking offers are based on Promo(s) NX/UU. Featured fares are per person based on double occupancy, cruise or Land+Sea Journeys only. Fares are in US dollars. Taxes, Fees & Port Expenses are additional on all fares and range from $95 to $1010. Subject to availability. Offers are per stateroom based on double occupancy, for 1st and 2nd guests sharing a stateroom and excludes 3rd/4th guests, except as provided herein. Offers are available for new bookings only, apply only to the cruise portion of Alaska Land+Sea Journeys, are not combinable with any other discounts and are not transferable or refundable. Offers are applicable on select 2020-2021 sailings. Signature Beverage Package has a daily limit of 15 beverages, which includes all beverages priced at US$9.00 or lower. Guests must order beverages one at a time and must be 21 years or older for alcoholic beverages. Sharing is not permitted. Beverage management reserves the right to revoke the package if misused and refuse service for any reason, including service of alcoholic beverages to intoxicated guests. Package excludes purchases made in Signature Shops, Mini Bar and In Room Dining, or beverages on Half Moon Cay. Pinnacle Grill dinner: Guests receive one dinner per person. Reservations and dining times will be assigned and a confirmation card will be placed in your stateroom upon embarkation day. Offer excludes Specialty Dining Events in the Pinnacle Grill such as Le Cirque, De Librije, Master Chef’s Table and Sommelier Dinner. Free or reduced fares for kids or 3rd/4th guests are based on sharing a stateroom with 1st and 2nd guests, are valid on select sailings, and are based on Promo NS. Reduced Deposit is valid for new bookings only. Bookings made on voyages requiring immediate final payment are not eligible for a reduced deposit. Cruise must be booked 03/21/19 – 03/27/19. Offer applies to select Celebrity Edge Europe cruises departing 05/15/19 – 10/21/19. Savings amounts are per person and based on stateroom category. Savings applied to cruise fare at checkout. Offer applies to first two guests in the stateroom. Free Kids offer applies to the cruise fare of third and fourth passengers up to 17 years of age, booked in an inside stateroom or higher. 50% Off Savings offer applies to the cruise fare of third and fourth passengers, 18 years of age or older, booked in an ocean view stateroom or higher. Offer based on guest age at the time of final payment. It’s All Included Offer: Each of the first two guests in an ocean view through Suite stateroom are eligible to receive four complimentary amenities (beverage package upgraded to Premium Package). Onboard credit is not redeemable for cash and expires on final night of the cruise. Offer applies to new individual bookings and to staterooms in non-contracted group bookings, is non-transferable, and not combinable with any other offer. Changes to booking may result in removal of Offer. Offers and prices are subject to availability, cancellation and change without notice at any time. ©2019 Celebrity Cruises. Ships’ registry: Malta and Ecuador. Starting from prices are based on lowest category, per person for the least expensive valid departure date, and are NOT valid on all departure dates noted. Prices do not include airfare. Only clients booked on select 11+ day cruises on the Diamond Deck may receive the $3,000 per couple savings. All others will receive up to $2,000 per couple savings. The information published is correct at the time of distribution and may include unintended inaccuracies or typographical errors. Pavlus Travel reserves the right to make corrections at any time. Offers are valid for new bookings until April 30th or the release of the 2020 Europe River Cruise full release brochure, whichever comes first. Free roundtrip economy air with a maximum value of $1,400 per person. Free roundtrip premium economy air with a maximum value of $2,100 per person. Scenic Savings are $750 in lieu of $395 air, $1,000/pp in lieu of free economy airfare and $1,500/pp in lieu of free premium economy airfare. Deposit at the time of booking and receive an additional $250/pp savings. Offers and fares are capacity controlled and may be changed, cancelled or withdrawn at any time. Scenic reserves the right to correct errors or omissions and to change any and all fares and promotions at any time. Availability is correct at the time of publishing but cannot be guaranteed. Please ask about upgrading your economy airfare offer to premium economy or business class air. These offers are combinable with past passenger offers, referral offers, travel show & agent training vouchers and groups. Not combinable with any other offers. Offers applicable for legal residents of the 50 United States of America. Pricing is accurate at date of publication. Pavlus Travel is not responsible for any typographical errors or pricing errors for any offer in the itineraries displayed. Offer is subject to availability and can be withdrawn at any time. Offer subject to availability and may be withdrawn at any time. Cannot be combined with Marco Polo Club single supplement discount or any other single supplement discounts. Classic Antarctica: Offer valid on new bookings only. $3,000 per person offer valid on stateroom categories 1-3. International air credit of $1,500 per person valid for all staterooms and suites. Air must be booked and ticketed through A&K USA, LLC. Airfare must be paid in full by the traveller for ticket issuance. Air credit will appear as a discount off the cruise on the traveller’s invoice. Offer subject to availability and may be withdrawn at any time. Other restrictions may apply. Antarctica, South Georgia & the Falkland Islands: Offer valid on new bookings only. $4,000 per person offer valid on stateroom categories 1-3. International air credit of $1,500 per person valid for all staterooms and suites. Air must be booked and ticketed through A&K USA, LLC. Airfare must be paid in full by the traveller for ticket issuance. Air credit will appear as a discount off the cruise on the traveller’s invoice. Offer subject to availability and may be withdrawn at any time. Other restrictions may apply. Antarctic Discovery: Palmer’s Bicentennial Expedition: $7,000 per stateroom offer valid on stateroom categories 1-3. Subject to availability and may be withdrawn at anytime. Fares and Pack these Values offers are based on Promo(s) NG. Featured fares are per person based on double occupancy, cruise or Land+Sea Journeys only. Fares are in US dollars. Taxes, Fees & Port Expenses are additional on all fares and range from $85 to $1285. Subject to availability. Offers are per stateroom based on double occupancy, for 1st and 2nd guests sharing a stateroom and excludes 3rd/4th guests, except as provided herein. Offers are available for new bookings only, apply only to the cruise portion of Alaska Land+Sea Journeys, are not combinable with any other discounts and are not transferable or refundable. Offers are applicable on select 2019-2020 sailings. Offers are capacity controlled, and may be modified or withdrawn without prior notice. Other restrictions may apply. Offers end May 15, 2019. Ships’ Registry: The Netherlands. Up to 50% Savings includes 40% discount from Scenic and 10% rebate from Pavlus Travel. Offer applicable on select 2019 departures sailing April-August, for new bookings made March 11-31, 2019. Pricing is per person, based on double occupancy and includes port charges. Up to 50% savings based on cruise only portion. Guests must pay in full at time of booking in order to receive savings. Offer is not combinable with groups or any other offers. 50% savings is not available on all dates or departures. Terms & Conditions: New bookings only. Early Payment Discount: 10% extended on select USA & Canada trips above. 5% discount available on other itineraries. Book by March 31, 2019. Valid for travel April 1-October 31, 2019 Prices are per person, land-only, and consider double occupancy (single supplements apply)- See 2019 USA & Canada brochure for details. ALL OFFERS: based on availability and may be withdrawn at any time and without notice. PAYMENT: A $200-$550 per person deposit is due within 3 days of booking with full payment by March 31, 2019. Further restrictions apply. Contact your Travel Advisor for details. CST No. 20687545-20. Our Pricing and Savings Policy: Unless stated otherwise, all rates are average per person, based on double occupancy, cruise only, in USD, and subject to availability. Rates may vary by ship, departure date, and stateroom category. All rates, savings, offers and itineraries are subject to change without notice. Savings and offers may be withdrawn at any time. Azamara reserves the right to correct any errors, inaccuracies or omissions and to change or update fares, fees and surcharges at any time without prior notice. Set Sale Offer (“Offer”) provides 50% off cruise fare of the second guest (“BOHOGO”) and $500 Onboard Credit (“OBC”). Offer applies to new individual bookings created between February 4, 2019 – March 31, 2019 (“Offer Period”). Offer applies to select sailings departing on or after April 6, 2019. *Share & Save (BOGOHO): Buy One Get One Half Off (“BOGOHO”) provides 50% off cruise fare of the second guest booked in the same stateroom as the first full fare paying guest. All other charges, including, but not limited to, cruise taxes, fees, and port expenses, are additional and apply to all guests. Offer applies to all stateroom categories; category availability varies by sailing. Offer may not be available on all categories on all sailings. BOGOHO+: Offer provides one Unlimited Internet package for guest booked in an oceanview or higher stateroom under BOGOHO offer. Unlimited Internet package provides guest with unlimited internet minutes for use onboard; one device per package. Internet connectivity and speed is subject to location of ship, availability of satellite signal, and is not guaranteed 100% of the time. Limit one offer per stateroom. Offer applies to new, individual bookings and non-contracted group bookings named and fully deposited during the Offer Period. Offer is not applicable to incentive or contracted groups. Offer is combinable with BOGOHO+, Back to Back Benefits, onboard booking savings and Le Club Voyage Quarterly Savings. Unless stated otherwise, offer is not combinable with any other offer or promotion, including, but not limited to, any other OBC offers, Last Minute Voyages, BPS Guarantee, Closed User Rates, Employee Rates, Interline Rates, Travel Agent Rates, and Net Rates. Offer is not applicable to 3rd and 4th guests in a stateroom. After the Offer Period, the offer will be removed from the booking if the guest cancels and reinstates the booking, applies a fare change, or changes the ship or sail date of the booking; certain other changes to the booking may also result in removal of the offer. Offer is subject to availability and change without notice and may be withdrawn at any time. This offer is applicable to U.S. and Canada residents only. Refer to AzamaraClubCruises.com/SHAREANDSAVE and the Cruise Ticket Contract for additional terms and conditions. ©2019 Azamara Club Cruises. Ships registered in Malta. Offer ends March 31, 2019. Standard terms and conditions apply. Not combinable with Red Hot Deals or Early Payment Discount but is combinable with Military Discount and Frequent Traveler Savings. Other restrictions may apply. Please contact your travel planner for more information. Pay your deposit within 3 days of booking. Pricing is accurate as of date of publication. Combinable only with Military Discount and Frequent Traveler Savings, NOT combinable with Early Payment Discount. Additional restrictions may apply. *March Suite Savings is valid on select 2019 & 2020 sailings. Premium Suite Shipboard Credit offer of up to $1,000USD per Suite ($500USD per person) is applicable to categories PH, PS, OW, SS, WG and GR. Shipboard credit is only available for the 1st and 2nd guests sharing a Suite. All Shipboard Credits are in U.S. Dollars, are not transferable, non-refundable, have no cash value, expire at the end of the cruise and may not be used in the casino. Shipboard Credit offers may not combine with other Shipboard Credit offers. Premium Suite Shipboard Credit offer is based on Promo ZO. Suite upgrade offer is based on Promo NG. Complimentary Veranda Suite upgrades are subject to availability at time of booking. Upgrade will be reflected in fare paid for selected Suite category. All offers are capacity controlled and may be modified or withdrawn at any time without prior notice. Other restrictions may apply. The March Suite Savings offer expires March 31, 2019. Ships’ registry: Bahamas. ©2019 Seabourn. On Board Credit is based on cruise only length as follows: 1-7 nights $300 OBC per couple; 8-14 nights $600 OBC per couple; 15+ nights $1,000 per couple. 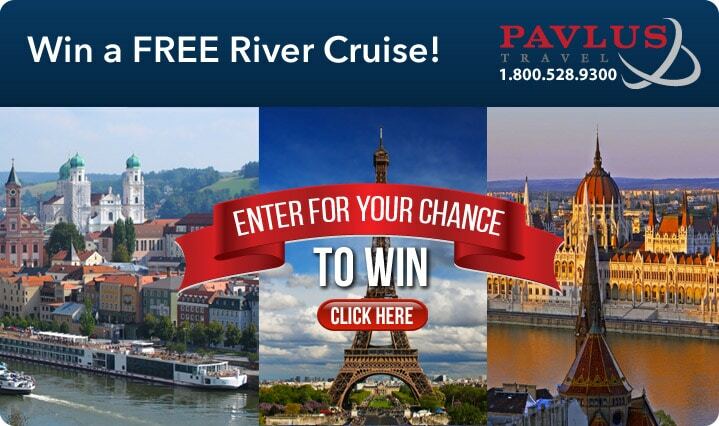 Additional $100 Onboard Credit offered exclusively by Pavlus Travel. Offer VR1: Offer valid on bookings made from Mar 7 to Mar 14, 2019. Cruise from $3,999 per person based on Jun-Aug 2019 departures of Paris to the Swiss Alps; Cities of Light in categories E & F; other departures may be higher, please call for details. Prices are in US dollars and for US residents only. Viking all-inclusive air with transfers available. Air does not have to be purchased to get cruise/tour offer. All fares reflect cruise taxes, port taxes and fees. Additional restrictions may apply. Book by Mar 14, 2019; pay in full by Apr 30, 2019 or within 90 days of departure, if earlier. Offer expires Mar 14, 2019. Air Promo: FREE Economy air based on Jun-Aug 2019 departures of Paris to the Swiss Alps; Cities of Light. Call for details. Air prices are per person based on cruise or cruise tour check-in date and include transfers. Air seats are limited; airfares are subject to change until full payment of air is received. Click here to learn more about airline baggage allowances and fees. Air offers valid on all N. American gateways except Alaska, Hawaii, San Juan and Mexico City. Ask for Offer VR1. Offer expires Mar 14, 2019. Up to $600 to spend on board per stateroom is based on voyage length and stateroom type. Offer is applicable to all guests (up to 2) in a stateroom. Guests with single occupancy will receive double the per guest credit amount. Money to spend on board may be used on a single voyage only, is not redeemable for cash, cannot be used in the casino and expires at the end of that voyage. Offer is not transferable and may not be combinable with other select offers or other onboard credits. Money to spend on board is based on the ship’s onboard currency. ††FREE room upgrade applies to booking the stateroom location you wish to sail in for the price of the lowest category within that stateroom type (Interior to Interior, Oceanview to Oceanview, Balcony to Balcony, and Mini Suite to Mini Suite excluding Club Class). Upgrade offer excludes select categories, including, but not limited to premium categories. Offer does not apply to the land portion of a cruisetour. ‡‡Fares from $99 for your extra guests apply to the 3rd and/or 4th guest booked in the same stateroom as the first and second guests and apply to minimum lead-in categories on a space-available basis at time of booking. Fares for other categories may vary. This offer has limited space regardless of stateroom availability and is subject to combinability limitations. *Fares apply to minimum lead-in categories on a space-available basis at time of booking. Fares for other categories may vary. Fares are non-air, cruise- or cruisetour-only, based on double occupancy and apply to the first two guests in a stateroom. These fares do not apply to singles or third/fourth-berth guests. This offer has limited space regardless of cabin availability and may not be combinable with any other public, group or past guest offers. Offer is not transferable and may not be combinable with other select offers and onboard credits. Offer is available to residents of the 50 United States, Canada, Puerto Rico, Mexico, Bermuda and the District of Columbia who are 21 years of age or older and receive this offer. Fares quoted in USD. Deposit of 10% per guest for bookings made under Come Back New Sale is refundable. Note: For assistance reserving a wheelchair-accessible stateroom, please call 1-800-774-6237. Offer valid: March 1 – April 30, 2019 on voyages in this sale only. Bonus Savings Days valid on new, individual bookings made between 1 March, 2019 and 31 March, 2019. Guest benefits from an extra savings per person, valid on all categories, on a selection of cruises sailing in 2019 and 2020. Guest is eligible for up to $250 savings per guest with a maximum of $500 savings per suite. Savings amount varies by voyage. Savings applied to cruise fare at checkout. Cancel and re-books do not qualify. Single supplements will apply and vary by voyage. Other restrictions may apply. Ships’ registry: Bahamas and Ecuador. Fares are based on Promo(s) QA/QF. Featured fares are per person based on double occupancy, cruise or Land+Sea Journeys only. Fares are in U.S. dollars. Taxes, Fees & Port Expenses are additional and range from $49.50 to $1,285.00. Subject to availability. Promotion codes QA: This promotional fare has a 50% reduced deposit that is 100% non-refundable unless one of our Cancellation Protection Plans is purchased at time of booking. Promotion codes QF fares have the following limitations: Payment must be made in full at the time of booking and fares and deposits are 100% non-refundable from the point of payment unless you purchase one of our Cancellation Protection Plans at time of booking. For full terms and conditions or further information applicable to your cruise, please refer to hollandamerica.com. Offers are capacity controlled, and may be modified or withdrawn without prior notice. Other restrictions may apply. Ships’ Registry: The Netherlands. Fares are per person in U.S. dollars, apply to new bookings only beginning March 1, 2019 based on double occupancy for the first two full-fare guests in stateroom or suite, include applicable Book Now Savings, and, do not include taxes, fees or port charges which vary by departure. All fares and savings vary by category and departure date. *Book Now Savings Promotion applies to new bookings made between March 1, 2019 and April 30, 2019 on select sailings only, is capacity controlled subject to availability, and may not be combinable with other offers. Ask for details. Solo Fares and Optional Personal Select Air Program are available upon request. Ask for details. All itineraries, fares, programs, promotions policies are subject to change at the discretion of Crystal Cruises. A cruise deposit, an amount which may vary by departure, is required at the time of booking regardless of voyage length. Crystal Cruises reserves the right to correct errors or omissions and to change any and all fares, fees, promotions and programs at any time with or without notice. Fares listed are for E2 or C3 and are subject to change without notice. Unavailable rooms may be waitlisted and will be cleared at Crystal’s discretion. $25 Reduced Deposit Offer is applicable to new bookings made Mar. 1st – 6th 2019, for select cruises departing June 1, 2019 – December 31, 2019. Reduced deposits are per person and exclude group bookings, suites, Celebrity Apex, Alaska Cruisetours and Galapagos sailings. Reduced deposit must be paid by deposit payment required due date. To redeem at celebritycruises.com, proceed to the payment page, select “Other” in the deposit field and enter the deposit amount. Standard full deposit penalty is applied if booking is cancelled within final payment period; see Celebrity’s cancellation policy for details. Refer to celebritycruises.com and the Cruise Ticket Contract for additional terms and conditions. Celebrity reserves the right to cancel the Offer at any time, correct any errors, inaccuracies or omissions, and change or update fares, fees and surcharges at any time without prior notice. ©2019 Celebrity Cruises. Ships’ registry: Malta and Ecuador. Pay your deposit within 3 days of booking. Greece & Eastern Mediterranean trips do not offer Early Payment Discount. Discounts apply to land only pricing, per person, for 2019 departures and may vary by departure date. Not combinable with any other CIE Tours offers or discounts, and not available on Group travel. Valid on new bookings only, may be withdrawn at any time, are subject to availability and other conditions may apply. Call for details. Offer subject to availability and can be withdrawn at any time. Cannot be combined with Marco Polo Club or any other single supplement discount. Not combinable with any other offer. Other restrictions may apply. Please contact your travel planner for more details. Offer is valid for new bookings only made on special Single Supplement departures found in Insight Vacations 2019 Europe & Britain brochure, are subject to availability and can be withdrawn or amended at any time without notice. Brochure Discounts apply and are subject to conditions and Single Supplement Savings are combinable with Early Payment Discount as long as it is featured in the price panel of the itinerary. Deposit required within 3 days of booking or if made within 45 days, full payment is required. Save $1,800 per stateroom ($900 per person) on the following American Duchess 2020 voyage: 6/21. Save $1,200 per stateroom ($600 per person) on the following American Countess 2020 voyage: 9/20; on the following American Duchess 2020 voyage: 8/2; and on the following American Queen 2020 voyage: 8/16. Save $600 per stateroom ($300 per person) on the following American Duchess 2020 voyages: 1/5, 1/12, 1/19, 1/26, 2/2, 2/9, 3/8, 3/15, 3/22, 3/29, 4/5, 4/12, 4/19, 5/3, 5/10, 5/17, 5/24, 5/31, 6/7, 6/14, 7/12, 7/19, 7/26, 8/16, 8/23, 8/30, 9/6, 9/13, 9/20, 9/27, 10/4, 10/11, 10/18, 10/25, 11/1, 11/8, 11/15, 11/22, 11/29, 12/6, 12/13, 12/20, 12/27; on the following American Queen 2020 voyages: 2/16, 2/23, 3/1, 3/8, 3/15, 3/22, 3/29, 4/5, 4/12, 4/19, 4/26, 5/3, 5/10, 5/17, 5/24, 5/31, 6/7, 6/14, 6/21, 6/28, 7/5, 7/12, 7/19, 7/26, 8/2, 8/9, 8/30, 9/6, 9/13, 9/20, 9/27, 10/4, 10/11, 10/18, 10/25, 11/1, 11/8, 11/15, 11/22, 11/29, 12/6, 12/13, 12/20, 12/27; on the following American Empress 2020 voyages: 3/15, 3/22, 3/29, 4/5, 4/12, 4/19, 4/26, 5/3, 5/10, 5/17, 5/24, 5/31, 6/7, 6/14, 6/21, 6/28, 7/5, 7/12, 7/19, 7/26, 8/2, 8/9, 8/16, 8/23, 8/30, 9/6, 9/13, 9/20, 9/27, 10/4, 10/11, 10/18, 10/25, 11/1, 11/8, 11/15, 11/22, 11/29, 12/6, 12/13, 12/20, 12/27; and on the following American Countess 2020 voyages: 4/5, 4/12, 4/19, 4/26, 5/3, 5/10, 5/17, 5/24, 5/31, 6/7, 6/14, 6/21, 6/28, 7/5, 7/12, 7/19, 7/26, 8/2, 8/9, 8/16, 8/23, 8/30, 9/6, 9/13, 10/4, 10/11, 10/18, 10/25, 11/1, 11//8, 11/15, 11/22, 11/29, 12/6, 12/29. Not valid on American Countess cabin category SO, American Duchesscabin category OS, American Empress cabin categories SO and LS and American Queen cabin categories SD, SI, and OS. Offer expires on 7/31/19 or when no valid cabins remain. Offer is valid only on new, paid-in-full bookings. Full payment at time of booking is required to redeem this offer. Offer open to U.S. and Canada residents only. Offer is based on cabin availability, and only while inventory lasts. Not valid on group bookings or existing reservations; cannot be combined with other promotions or discounts. Promotional fares and amenities are capacity-controlled, may vary by sailing and may be withdrawn without notice. Cruise fares quoted are in U.S. dollars, are per person and do not include government taxes and fees, port charges, airfare, insurance, personal expenditures or transportation costs incurred while traveling to and from embarkation ports. Gratuities not included in cruise fares for American Queen, American Empress and American Countess. Not responsible for errors or omissions. Additional terms and conditions may apply. Call for details, and mention Offer Code 2020 EBD1. All rates are per person in USD for cruise only and based on double occupancy in a base category stateroom unless stated otherwise. Bonus $200 Wave Savings are per stateroom and valid on new bookings only made by March 31, 2019 (solo travelers receive $100 savings.) Must ask for promo code: WAVE19. Bonus $200 Wave Savings is applicable to select 2019 dates and is combinable with current retail saving promotions. Excludes Wine Cruises. Offer is combinable with Group Discounts and other special fare offers. Unless explicitly stated that single supplement is waived, solo travelers in a double occupancy stateroom must pay an additional single supplement amount before receiving any discounts. Offers are combinable with AmaWaterways’ Past Passenger Privilege Program and Onboard Future Cruise Benefit Program. Offers are limited to availability, are capacity controlled and are subject to change/termination without notice. Port charges, stateroom upgrades, optional land programs, gratuities, and airfares are additional. Other restrictions apply. Registration as a seller of travel does not constitute approval by the State of California. *Standard terms apply. View complete terms and conditions in addition: *Offer expires 2/20/19. Ask for Presidents Day promotion. Fares are per person in U.S. dollars, valid for residents of United States and Canada, based on double occupancy (unlessotherwise noted), for new bookings only and may be withdrawn at any time. Category upgrade is based on availability and is capacity controlled. Number of categories upgraded varies based on cruise andcategory booked. Free Internet amenity does not include streaming and includes one log-in per stateroom, except Owner’s, Vista & Oceania Suites, which receive two log-ins per suite. Visit OceaniaCruises.com/Internet for more details. OLife Choice amenities are per stateroom, based on double occupancy and subject to change. OLife Choice free shore excursions vary by voyage and exclude Oceania Select, OceaniaExclusive, Executive Collection, Food & Wine Trails, Wellness and Culinary Discovery Tours. Voyages up to 9 days receive 4 free shore excursions; 10-13 days receive 6 free shore excursions; 14+ days receive8 free shore excursions. If shore excursion amenity is selected, all excursions must be chosen at least 14 days prior to sailing. OLife Choice beverage package amenity is House Select. Guests in the samestateroom must choose the same OLife Choice amenity, and amenity must be chosen by final payment. Not all promotions are combinable. 2 for 1, OLife Choice and Oceania Club Fares are based on publishedFull Brochure Fares; such fares may not have resulted in actual sales in all suite and stateroom categories and do not include optional charges as detailed in the Guest Ticket Contract, which may be viewed,along with additional terms here. If applicable, Cruise-Only Fares do not include OLife Choice amenities or airfare. All Fares include government fees & taxes. Airfare does not include groundtransfers, and offer applies to coach, roundtrip flights only from the following airports: ATL, BOS, CLT, DCA, DEN, DFW, DTW, EWR, IAH, IAD, JFK, LAX, LGA, MCO, MDW, MIA, ORD, PHL, PHX, SAN, SAV, SEA, SFO, TPA,YOW, YUL, YVR, YYZ. Oceania Cruises reserves the right to assign gateways based on availability for JFK, LGA and MIA. Gateways are subject to change at any time. Airfare is available from all other U.S. andCanadian gateways for an additional charge. Airfare includes all airline fees, surcharges and government taxes. Airline-imposed personal charges such as baggage fees may apply. Air Upgrade, if applicable,is a Premium Economy Air Upgrade only available when air is purchased through Oceania Cruises. It applies to intercontinental flights only and is priced per person, each way, on select voyages from selectgateways, open to all categories for European embark and/or disembark ports only and based on availability. Oceania Cruises voyages calling on Cuba fully comply with the existing U.S. Federal Regulationsand the most recent pronouncements from the Office of Foreign Assets Control (“OFAC”) of the U.S. Department of the Treasury. Please see our website for additional visa and documentation requirements.Oceania Cruises reserves the right to correct errors or omissions and to change any and all fares, fees, promotions and surcharges at any time. Ships’ Registry: Marshall Islands. $20 Reduced Deposit Offer is applicable to new bookings made Feb. 13th – 19th, 2019, for select cruises departing June 1, 2019 – April 30, 2021. Reduced deposits are per person and exclude group bookings, suites, Celebrity Apex, Alaska Cruisetours and Galapagos sailings. Offer is not combinable with nonrefundable deposit offers. Reduced deposit must be paid by deposit payment required due date. Offer is applicable to the United States, Canada, Australia and Mexico. To redeem at celebritycruises.com, proceed to the payment page, select “Other” in the deposit field and enter the deposit amount. Standard full deposit penalty is applied if booking is cancelled within final payment period; see Celebrity’s cancellation policy for details. Refer to celebritycruises.com and theCruise Ticket Contractfor additional terms and conditions. Celebrity reserves the right to cancel the Offer at any time, correct any errors, inaccuracies or omissions, and change or update fares, fees and surcharges at any time without prior notice. ©2019 Celebrity Cruises. Ships’ registry: Malta and Ecuador. ** Flights by Celebrity Offer applies to new individual bookings made Feb. 13th – 19th, 2019. Offer provides up to 20% savings on select flights and airlines. Flights by Celebrity offer only available for sailings departing within 330 days of booking. Offer applies to air fares from select US and Canadian gateways. Offer excludes group bookings, Galapagos sailings and Celebrity Explorations. All guests traveling by air will be required to submit their full legal names at the time of booking. Price shown at time of purchase reflects the discounted price. To redeem at celebritycruises.com, proceed to www.celebritycruises.com/flightsbycelebrity to book flights. Celebrity’s cancellation policy applies, including but not limited to full cancellation penalty amounts. Guests in the same stateroom may book different flights. Air tickets may be purchased on a non-refundable or refundable basis and are each subject to the cancellation terms of the applicable airlines and Flights by Celebrity. Offer is subject to availability, subject to change, capacity controlled, non-transferable, and may be withdrawn at any time without notice. Luggage restrictions and fees vary by airline. •	Offer is valid for new bookings only starting on 1/28/19; there is no book by date; offer is subject to availability and may be closed at any time without notice. •	Standard retro policy applies. •	Offer is valid in USD only, but open to guests in the U.S. and Canada. •	Guests will receive $500 Savings per person (up to $1,000 per suite) on 7-night voyages and a $750 Savings per person (up to $1,500 per suite) on 10+ night voyages. Please refer to chart below for applicable voyages. •	Offer is available to guests in Deluxe Veranda through Penthouse Suites (Category A-H). •	Mention “ALASKA SAVINGS” at time of booking. •	Guests will enjoy a $500 Shipboard Credit per suite on select Alaska, Northern Europe, Mediterranean and Panama Canal voyages when they book by February 15, 2019. After that date, guests will enjoy a $250 Shipboard Credit per suite when they book by March 31, 2019. Non-Refundable Fares on Select 2019 Alaska voyages! With this offer, guests in the U.S. and Canada who pay in full at time of deposit, will receive 10-15% savings in select Suite Categories. The standard option period applies — full payment is due at time of deposit, at which point the booking is under 100% cancellation penalty. •Offer is valid for new bookings only starting on 2/1/19; the book by date is the sail date for each applicable voyage. • Offer is capacity-controlled, subject to availability and may be withdrawn at any time without notice. • Standard retro policy applies. • Offer is available to guests in the U.S. and Canada. • Offer will not be publicly promoted on the Regent website. • Guests will receive 10-15% savings off cruise-only fares on applicable voyages (see below); full payment is due at time of deposit, at which point the booking is under 100% cancellation penalty. • Standard hotel program or credits apply. Air is available for $600 per person, in addition to secondary gateway charges or applicable deviations. • Offer is available to guests in Deluxe Veranda through Horizon View Suites only (Category HS-H). • Regent Guest Travel Protection Program Insurance is not available to guests booking Non-Refundable Fares. • Offer is commissionable per normal terms. • Mention “NON-REFUNDABLE FARES” at time of booking. *USD Fares above reflect Limited Time Alaska Savings for applicable voyages, and include air from our standard FREE gateways. •	The seven 2019 Alaska voyages below will be added to our Canadian Dollars at Par offer; valid from 1/28/19 through 3/31/19. Standard Canadian Dollars at Par T&C apply — not combinable with Limited Time Alaska Savings or Time to Explore. •	The seven 2019 Alaska voyages below will be added to our Single Supplement offer; valid from 1/28/19 through 3/31/19. •	50% Single Supplement will be available on Category F-H only. Standard Single Supplement T&C apply — is combinable with Limited Time Alaska Savings and Time to Explore. •	If a Seven Seas Society member refers a First-Time Regent guest who sails on a 2019 Alaska voyage, both will receive double the Ambassador savings — $500 vs. our standard $250. This Double Ambassador Savings is combinable with all offers. There is no book by date; offer is subject to availability and may be closed at any time without notice. Referrals should be inputted into the form located on the Ambassador page per the standard process: https://www.rssc.com/ambassador. •	If a guest applies an existing, unused Future Cruise Deposit towards a 2019 Alaska voyage, they will receive double the savings. There is no book by date; offer is subject to availability and may be closed at any time without notice. Offer is not applicable to categories BX and MX (Sail Away Categories). Valid on 3+ night sailings. Free at Sea choice(s) must be selected at least 24 hours prior to sailing and cannot be changed on board. Bookings made within 24 hours to departure can choose promotion at time of booking. Offer is capacity controlled and can be withdrawn at anytime. Guest cannot substitute or customize this offer. All guests in stateroom must choose same offer. This is a cruise only offer. This promotion is not applicable on the land portion of Cruisetours or bundles. Offer is for new individual FIT reservations and new speculative groups delegates. Qualifying new individual FIT reservations can be moved into an existing speculative group and count towards tour conductor credits. Offer only valid on select sailings. Air gateways are capacity controlled and subject to availability. Select sail dates may have gateways that are not eligible for the air offer. 3rd-8th guests will receive 25% off Norwegian Cruise Line’s regular air/sea rates. Guests may not deviate air when selecting the free or reduced air option, except Pride of America sailings. Guests booked on Pride of America sailings may request to deviate air up to 2 days pre/post cruise. A deviation fee of $50 USD per person will be charged on Pride of America sailings. Norwegian Cruise Line reserves the right to choose the air carrier, routing and city airport from each gateway city and reserves the right to substitute commuter service and/or charter air service for scheduled air carriers without prior notice. Includes air taxes, fees & surcharges. Ultimate Beverage Package is applicable to all qualified sailings excluding Pride of America and 3-6 night Sun & Sky sailings. Applicable to guests 1-2 on the reservation. Guest must be at least 21 years of age at time of sailing to qualify for the Ultimate Beverage Package. Guests under 21 will receive the soda package. Eligible guests are entitled to two beverages per person per transaction. Includes a variety of spirits and cocktails, wines by the glass and bottled or draft beer up to $15 USD retail price. Includes fountain soda, juice, and non-alcoholic beer. A 20% discount will be given on bottles of wine (champagne and sparkling included), Wine and Spirit Experiences, tastings or Flights purchased on board. Offer is not applicable at Harvest Caye bars, restaurants, or venues. Does not include: Wine and Spirit Experiences, tastings or Flights, Starbucks, Ice Bars, room service, package sales, bottled water, ship specific promotions or beer buckets, designated super premium brands (subject to change), bottled wine, mini bar purchases, fresh squeezed juices, Lavazza coffee beverages, wine dispenser, energy drinks or vending machines. Guest who receive the Soda Package may obtain fountain soda at any bar, lounge or restaurant throughout the duration of the cruise, excluding Harvest Caye bars, restaurants, or venues. Guest’s check may reflect applicable VAT and/or taxes for certain ports or itineraries. Guest is responsible for 20% gratuities on the retail value of the Ultimate Beverage Package ($19.80 USD per person per day) and/or Soda Package ($1.59 USD per person per day) prior to cruise. Retail value of Ultimate Beverage Package is $99.00 USD per person per day. Package price is subject to change. Retail value of the Adult Soda Package is $7.95 USD per person per day. Package price is subject to change. Guests 1-2 regardless of age will receive the Premium Plus Beverage Package. However, guests under the age of 21 at the time of sailing, may not consume alcoholic beverages. Includes all beverages by the glass. Beverage selection is subject to change onboard. Includes select wines by the bottle when dining. Includes fountain soda, freshly squeezed juice, bottled water (flat and sparkling), non-alcoholic beer, and specialty coffee (specialty coffee inclusion shall be limited to dining rooms only). A 40% discount will be given on bottles of wine (champagne and sparkling included), Wine and Spirit Experiences, tastings or Flights purchased on board. Does not include: Wine and Spirit Experiences, tastings or Flights, specialty coffee outside of the restaurants, room service, mini bar purchases, wine dispenser or vending machines. Guest is responsible for 20% gratuities on the retail value of the Premium Plus Beverage Package ($5.80 USD per person per day) prior to cruise. Retail value of Premium Plus Beverage Package is $29.00 USD per person per day. Package price is subject to change. No substitute for package if guest cannot consume all beverages included. Hawaii Beverage Package is applicable to Pride of America sailings only. Includes a variety of beverages up to $15 USD retail price. Also includes fountain soda, freshly squeezed juice, bottled water (flat and sparkling), non-alcoholic beer, and specialty coffee (specialty coffee inclusion shall be limited to dining rooms only). Does not include: specialty coffee outside of the restaurants, room service, mini bar purchases, or vending machines. Guest is responsible for 20% gratuities on the retail value of the Hawaii Beverage Package ($19.80 USD per person per day) prior to cruise. Retail value of Hawaii Beverage Package is $99.00 USD per person per day. Package price is subject to change. The purchase of any alcoholic drinks within the Hawaii Beverage Package may, in certain individual circumstances, be restricted in accordance with Hawaii’s Intoxicating Liquor Law and applicable local rules and regulations. Package prices are subject to change. Guest is responsible for 20% gratuities on the retail value of the Specialty Dining Package prior to cruise. Packages are based on a per meal basis. Dining package is applicable to guest ages 2 and older. Any Harvest Caye bars, restaurants, or venues, Food Republic, The Bake Shop, Ice Cream Bar, Gelato, specialty items in the Asian restaurant, Special Occasion/Holiday menus (New Year’s, Christmas, etc. ), Jazz Brunch, Wine Lovers and Murder Mystery lunches, and beverages are not included as part of the Specialty Dining Packages. You may choose to dine in the following venues as part of your Specialty Dining Package for the corresponding upcharges: Cabaret ($15 USD), For the Record ($15 USD), Ocean Blue ($10 USD), Bayamo ($10 USD), Cirque Dreams ($10 USD regular seats/$15 USD premium seats/$35 USD VIP seating on Breakaway), Sushi Bar ($7 USD), Pincho Tapas Bar ($7 USD), and Raw Bar ($7 USD). Specialty Dining Packages include one main course per person at Cagney’s and Le Bistro restaurants. Additional main courses will be charged at the a la carte price listed on the menu. There is no minimum or maximum to the number of meals that can be redeemed in a day, however each meal is counted towards the package. Internet package is based on number of nights. 100 minutes per stateroom for 3-6 Day Cruises. 250 minutes per stateroom for 7-11+ Day Cruises. Offer will be applied to the first guest in the stateroom. Internet package is per stateroom. One login per stateroom. Internet package is not available at Great Stirrup Cay or Harvest Caye. Internet package includes activation fee. $50 USD per port shore excursion credit is per stateroom. Credit has no monetary value and is nonrefundable. In the event a port of call or excursion is missed, for any reason, no refund or credit will be issued. Shore excursion credit is applicable for each port, including debarkation port, and is not transferable to other ports. Use the credit or lose it. Does not include embarkation ports. Overnight stays count as one port, except Bermuda sailings which can receive up to 3 individual days of shore excursion credit. Shore excursion credit can be redeemed by calling 1-866-625-1167 or booking onboard. For the guests that book their excursions online; they are charged full retail for the excursions and the discount will be applied onboard in the form of a credit to their onboard account. Offer valid for guests 3-4 sharing a stateroom with guests 1-2 paying full fare. 3 & 4 Guests Sail Free dates are subject to change at any time without notice. No deposit is required for qualifying 3 & 4 guests. If there are guests 5 – 8 in a reservation, those guests will be required to pay prevailing fares. Pavlus GUARANTEES to sell this vacation below Club Med Prices. Never pay retail for any Club Med vacation. For our UNADVERTISED Discount Price, fill out this form for real cash savings. WINDSTAR FARE PRICE ASSURANCE POLICY: Guests who purchase a cruise on Windstar will be eligible for reimbursement upon request if the fare published by Windstar for their specific departure and cabin class is reduced after they have made a booking and deposit, and if the request is received by Windstar at least 120 days prior to sailing. The reimbursement will be provided in the form of a shipboard credit, upgrade, fare reduction, or a future cruise credit. Windstar will determine the form of reimbursement, and the amount of reimbursement will be the difference between the fare actually paid by the guest and the published fare on WindstarCruises.com the day the request is received. Guests who select reimbursement will be eligible for any complimentary inclusive features (e.g., hotels, air, tours) associated with the new fare and will forfeit any complimentary inclusive features associated with the original fare. All requests for reimbursement must be made directly to Windstar Cruises at 866-884-8032 (during regular reservations hours) at least 120 days prior to sailing. Windstar’s new fare pricing assurance policy will take effect with new bookings made on or after August 15, 2018. Windstar reserves the right to modify or terminate this policy at any time for bookings not yet made. Policy does not apply to certain promotions or guests outside of the US or Canada. RESERVATIONS AND PAYMENT: Windstar Cruises works with travel agencies worldwide to serve your needs. Reservations either made by or assigned to a travel professional must be managed by the agency of record. While Windstar is unable to provide specific booking information on agency bookings, we are happy to answer general questions. Alternatively, you may reserve your cruise directly with us if you prefer. Since accommodations are limited by the number of staterooms or suites on each yacht, reservations should be made as early as possible. Payment for your Windstar cruise is to be made to the travel agency with which you made your reservation, or to Windstar Cruises directly. Travel documents will be issued when full payment has been received by Windstar Cruises. Refunds for cancelled or unused services will be made, less any applicable cancellation fees and charges. If you have reserved your cruise with your travel professional, please be aware that additional cancellation fees charged by the booking agency may apply. DEPOSIT AND FINAL PAYMENT REQUIREMENTS: Deposit of 15% of cruise fare, hotel, and non-discountable amounts is required within three (3) days of booking to secure a reservation. Final payment is due prior to 90 days before departure date. Your travel documents are usually received approximately 60 days prior to departure. If booking directly with Windstar Cruises, send payments to Windstar Cruises, 2101 4th Avenue, Suite 210, Seattle, WA 98121, U.S.A. Payment is also welcome by American Express®, Discover Card®, Visa®, or MasterCard®. For faster processing, please include your confirmation number on your check. All charges are in USD. Windstar is not liable for any currency exchange rate or foreign exchange fee imposed by the bank or credit card company. Payment of the cruise deposit and Travel Protection Plan (if applicable) constitutes a binding of the Terms & Conditions and acceptance of the Passage Contract. Your ticket is the Cruise Contract (available at www.disneycruise.com/cruisecontract). The forms needed for your vacation can be completed online by registering and logging into disneycruise.com and selecting “My Disney Cruise” or you will receive this package within 28 days of sailing. Carefully read your Cruise Contract, as it contains important terms and conditions which govern your cruise vacation and affect your legal rights. It must be signed by all Guests prior to embarking any Disney Cruise Line ship. In the event of conflict between the terms and conditions contained in the Cruise Contract, these Terms and Conditions, the terms of any Disney Cruise Line advertisement or offer, and the oral or written representations of any Disney Cruise Line representative, the terms and conditions contained in the Cruise Contract shall control. Minors under the age of 18 not traveling with a parent or legal guardian must be accompanied by an adult 21 years of age or older in the same stateroom. The parent or guardian of any minor not traveling with a parent or guardian must appoint an adult to have custody and control over the minor and to contract on their behalf in connection with the Disney Cruise Line vacation. A minor authorization form can be obtained by visiting disneycruise.com and selecting “My Disney Cruise” or is sent when a document package is mailed. The form must be signed by a parent or legal guardian prior to embarkation at the Disney Cruise Line Terminal. After 9:00 PM, adult entertainment districts are restricted to Guests 18 years and older. Each Guest may bring aboard the ship a reasonable amount of clothing and personal effects without charge, not to exceed 2 bags per person. All Guest baggage must be stored in the Guest’s stateroom and must be labeled with the Disney Cruise Line baggage tag. Dangerous or illegal articles such as weapons, explosives, liquid oxygen, combustible substances or nonprescription controlled substances may not be brought to Walt Disney World® Resort or taken aboard the ship. Any such items shall be surrendered to the Master of the ship at embarkation, and may be disposed of at the sole discretion of the Master. You should retain valuables such as cash, negotiable securities or other financial instruments, gold, silverware, jewelry, ornaments, works of art, photographic/video/audio equipment or supplies, laptop computers, cellular phones or other valuables in your personal control as Disney Cruise Line is not responsible for damage to or loss of these items. Each Guest 21 years and older may bring two bottles of unopened wine or champagne (no larger than 750ml) or six beers (no larger than 12oz) onboard in carry-on luggage at the beginning of the voyage and at each port-of-call. All wine/champagne and beer brought onboard must be packed in the Guest’s carry-on luggage. Any alcohol packed in checked luggage will be removed and stored until the completion of the cruise. Guests are not allowed to bring liquors or spirits (including powdered alcohol) onboard. A deposit is required to confirm a reservation. Deposit amount will be determined at time of booking. Vacation and cruise packages are subject to cancellation if full deposit is not received in our office within the option period specified at time of booking. For reservations confirmed in U.S. Dollars, final payment in the form of a check or credit card (Visa®, MasterCard®, American Express®, Discover® Card, Diners Club®, Japanese Credit Bureau or Disney Visa® Card) must be received on the date determined at the time of booking. For reservations not confirmed in U.S. Dollars, acceptable forms of payment are Visa® and MasterCard®. Payment policy for group travel may vary. Please contact your Travel Agent for complete details. Failure to strictly comply with the deposit and final payment schedules, or any other applicable policies and procedures, will result in the automatic cancellation of pending reservations. Offer is valid December 3, 2018 – March 31, 2019. *Signature Savings offers expire February 19, 2019. Featured fares are per person based on double occupancy and promo NV. Fares are in U.S. dollars. All savings amounts are included in fares shown. Taxes, Fees & Port Expenses are additional and range from $90.00-$2850.00. Offers are not combinable with any other discounts and are not transferable or refundable. Offers are applicable on select 2019 & 2020 sailings. Complimentary two or three category Veranda Suite upgrade is valid on select sailings and subject to availability at time of booking. Upgrade will be reflected in fare paid for selected Suite category. Combination cruise savings of up to 15% applies when combining consecutive cruises on the same ship and is subject to availability. Reduced deposit offer is valid on select sailings that are outside of penalty periods per policy. Shipboard credits are available in the following amounts by product: Coastal, Cuba & Mediterranean up to $200USD per Suite ($100USD per person); Canada, Caribbean & Northern Europe up to $300USD per Suite ($150USD per person); Alaska up to $400USD per Suite ($200USD per person); Antarctica, Arabia, Asia, Australia, New Zealand, Panama Canal, South America & South Pacific up to $500USD per Suite ($250USD per person). Premium Suite shipboard credit offer of up to $1,000USD per Suite ($500USD per person) is valid on select sailings and is available only in Suite categories PH, PS, OW, SS, WG and GR. All shipboard credit offers are in U.S. dollars and are non-refundable, non-transferable, have no cash value, expire at the end of the cruise, may not be used in the casino and are not combinable with any other shipboard credit offer. Shipboard credits are based on promo ZC. Complimentary Internet Package includes 300 minutes of internet access per guest for 1st & 2nd guest booking in Ocean View and Veranda Suites. Unlimited Internet Package is offered on a per Suite basis and only in Suite categories PH, PS, OW, SS, WG & GR. Internet service is not guaranteed. Seabourn is not responsible if internet service is unavailable. No credit or other compensation will be provided should internet service not be available. Internet Packages are based on promo ZI. Air credit is available for round-trip flights booked through Seabourn’s Flight Ease® program. Air credit is available to guests 1 & 2 sharing a Suite, is non-transferable, and is not combinable with any other fares. Certain restrictions may apply. Seats are limited and may not be available on every flight. Air fares include one complimentary checked bag, additional fees for baggage and other charges may be directly assessed by airlines or airports; please refer to the applicable airline website for further information. Air must be booked no less than 30 days prior to voyage sail date in order to be eligible for the air credit. Air Credit is based on promo JX. Shipboard Credits, Internet Packages and Air Credits are not combinable with any other offers. All offers are capacity controlled and may be modified or withdrawn at any time without prior notice. Other restrictions may apply. Seabourn reserves the right to correct errors. Ships’ registry: Bahamas. ©2018 Seabourn. Offer is capacity-controlled and applies to new bookings only made between 1/7/19 and 3/31/19. Offer is combinable with standard published promotional offers, however, is not combinable with Canadian Dollars at Par or Ultimate Alaska. On the May 26, June 5, June 12, July 3, July 13, July 24, July 31, August 7, August 14, August 21, August 28, September 4, September 11, September 18 and September 30, 2019 voyages aboard Seven Seas Mariner®; the May 4, May 14, May 24, July 2, July 22, July 29, August 9, August 19, August 29, and October 8, 2019 voyages aboard Seven Seas Voyager®; and the June 25, July 2, July 12, August 20 and August 30, 2019 voyages aboard Seven Seas Explorer®, guests will enjoy a $500 USD Shipboard Credit per suite when they book between 1/7/19 and 2/15/19. On the same voyages, guests who book between 2/16/19 and 3/31/19 will enjoy a $250 USD Shipboard Credit per suite. Shipboard Credit is per suite, non-transferable and may not be redeemed for cash. Offer may be withdrawn at any time. Mention “TIME TO EXPLORE” at time of booking. *Offer WC1: Offer valid on bookings made from Jan 6 to Jan 31, 2019. Cruise from $7,999 per person based on Feb 12, 2019 departure of Islands of the South Pacific in categories V2-DV1; cruise from $6,999 per person based on Mar 16, 2019 departure of Southern Australia to South Africa in categories V2-DV1; cruise from $7,999 per person based on Apr 13, 2019 departure of Along Africa’s Western Shores in categories V2-DV1; other departures may be higher, please call for details. Prices are in US dollars and for US residents only. Viking all-inclusive air with transfers available. Air does not have to be purchased to get cruise/tour offer. All fares reflect cruise taxes, port taxes and fees. Additional restrictions may apply. Book by Jan 31, 2019; pay in full at time of booking. Offer expires Jan 31, 2019. Air Promo: FREE Economy air based on Feb-Apr 2019 departures of Islands of the South Pacific; Southern Australia to South Africa; Along Africa’s Western Shores. Call for details. Air prices are per person based on cruise or cruise tour check-in date and include transfers. Air seats are limited; airfares are subject to change until full payment of air is received. Click here to learn more about airline baggage allowances and fees. Air offers valid on all N. American gateways except Alaska, Hawaii, San Juan and Mexico City. Ask for Offer WC1. Offer expires Jan 31, 2019. *Prices are per person, cruise only, for stateroom category 8 or Y, select sailings and based on double occupancy. Cruise must be booked Jan. 3 – 31, 2019 (the “Offer Period”). Offer applies to select 4-night and longer cruises departing 2/1/19 – 05/11/20. Offer excludes Galapagos, repositioning, transatlantic and transpacific cruises. Eligible sailings listed here. Non-Refundable Deposit Offer: To qualify for an additional perk guest must choose a non-refundable deposit on sailings departing 05/01/19 – 04/30/21. Non-refundable deposit booking (“NRDB”) cancelled prior to final payment due date will receive a future cruise credit in the amount of the deposit minus a $100 per person service fee. FCC is non-transferable and expires after 12-months from issue date. $100 per person service fee applies to changes to NRDB ship or sail date. Applicable to groups at prevailing rates. Not applicable to incentive, contract, or charter groups. Nonrefundable deposit offers are not applicable to sailings within final payment. Full deposit must be paid by deposit payment required due date. Standard full deposit penalty is applied if booking is cancelled within final payment period; see Celebrity’s cancellation policy for details. Savings amounts are per person and based on stateroom category: $50 for inside; $100 for ocean view and veranda; $150 for Concierge Class and AquaClass; $200 for Suites. Savings applied to cruise fare at checkout. Offer applies to first two guests in the stateroom. 50% Off Savings: Savings applies to the cruise fare of the third and fourth passengers booked in a triple, quad, or family ocean view, veranda, Concierge Class or suite stateroom. Not applicable to Cruisetours or Celebrity Explorations. Free Perks Offer: Each of the first two guests in a qualifying ocean view, veranda, Concierge Class, or AquaClass stateroom are eligible to receive two complimentary amenities: Classic Beverage Package, Unlimited Internet Package, $150 per person onboard credit (“OBC”), or Prepaid Gratuities. For an additional charge, guests may receive four amenities with an upgrade to the Premium Beverage package. Charge varies by number of cruise nights. All guests in the same stateroom must select the same options and provide Celebrity with the selected options at the time of booking. Promo codes are not required. Each of the first two guests in a qualifying suite booking are eligible to receive four complimentary amenities: Premium Beverage Package, Unlimited Internet Package, $150 per person onboard credit (“OBC”), and Prepaid Gratuities. Guests with Internet Packages will receive instructions for Internet access in their staterooms on the first day of the cruise. OBC option: Guests’ onboard account will be credited with an OBC. OBC has no cash value, is applicable to cruise only, non-transferable, not redeemable for cash, and will expire if not used by 10:00 PM on the final night of the cruise. Prepaid Gratuities option provides for prepaid stateroom, waiter, assistant waiter, and headwaiter gratuities in the amount suggested by Celebrity’s guidelines. Gratuities will be applied to the reservation within 10 days of booking date. Offer applies to new individual bookings and to staterooms in non-contracted group bookings, which must be named and deposited during the Offer Period. Offer is capacity controlled, availability varies by sailing, and eligible staterooms may sell out. All offers are non-transferable and applicable only to the Offer Cruise. Offer is not combinable with Book & Go Packages, Exciting Deals, Interline, Senior, Loyalty, Resident, Net, Travel Partner, and Employee Rates. No refunds or credits will be granted for unused options. Offer and prices are subject to availability and change without notice, capacity controlled, and not applicable to charters or contracted groups. Single occupancy bookings are eligible for the Offer. Changes to booking may result in removal of Offer. Refer to celebritycruises.com and the Cruise Ticket Contract for additional terms and conditions. Celebrity reserves the right to cancel the Offer at any time, correct any errors, inaccuracies or omissions, and change or update fares, fees and surcharges at any time without prior notice. Offer is valid for new bookings made January 1 – March 31, 2019 and departing in 2019. Offers and fares are capacity controlled and may be changed, cancelled or withdrawn at any time. Guests may select one offer per person and it must be the same offer for the entire booking. One pre or post cruise extension per person, per cruise. Extensions are not available on all itineraries, contact us for details. Free roundtrip economy air with a maximum value of $1,400 per person. Free roundtrip premium economy air available for Jewels of Europe, Romantic Rhine & Moselle and Breathtaking Bordeaux with a maximum value of $2,100 per person. Scenic Savings are $1,000/pp in lieu of economy airfare and $1,500/pp in lieu of premium economy airfare. 2-category upgrade valid on balcony suites or higher. Pay in full at the time of booking by February 28th and receive up to an additional 300€ on board credit per suite. Offers are based on number of cruise days, and exclude the land portion of the trip. Scenic reserves the right to correct errors or omissions and to change any and all fares and promotions at any time. Availability is correct at the time of publishing but cannot be guaranteed. A non-refundable initial deposit of $500 per person is required at the time of booking, with full payment required 90 days prior to departure. If air offer is selected, flights must be booked through Scenic, on our choice of airlines and are non-refundable once ticketed. A secondary deposit of $1500 per person is due upon airfare ticketing. These offers are combinable with past passenger offers, referral offers, travel show & agent training vouchers. Not combinable with Groups, National Geographic departures or any other offers. For the most up-to-date pricing, availability and offers, please call Scenic USA or your Travel Professional. Offers applicable for legal residents of the 50 United States of America & Washington D.C.
Prices include airfare, fuel surcharges, airport taxes and fees. All prices are per person based on twin occupancy. Air & land tour prices apply from the gateway airport or city specified in the Package Highlights. Prices will vary from alternative gateway airports or cities and may be higher. The total price will be clearly displayed prior to any deposit being required. Additional baggage charges may apply.